Background: Minimally invasive surgery is based on visualization with less reliance on tactile feedback. Therefore, the type of laparoscope, location of the laparoscopic working port, light transmission, viewing angle, depth of view, camera, magnification, image display and clarity are critical. Rigid laparoscopes with fixed viewing angles are the most employed worldwide because of their ease of use. Our experience with a new multi-view rigid laparoscope capable of multiple selectable viewing angles is presented. Methods: Eight anesthetized adult 60-70 kg female pigs underwent laparoscopy in the standard fashion. HD monitors, HD CCU (camera control unit) and 300 xenon light source and the same HD camera were used for SRT and MV telescopes. A 10′ mm 30′ standard rod-lens telescope (SRT) was compared with a new multi-view rigid rod-lens telescope (MV) with a rotating prism at the tip. The MV provides a 0′ to 120′ uniform illumination. The images were studied and recorded at mid-range and minimal magnification at 0′, 30′, 45′, 70′ and 90′ viewing angles. Two sites (gall bladder hilum and greater curvature of the stomach were observed for detail, illumination/shadow, perspective and perceived depth of field. Fan retractors and graspers were introduced in each view. 180 still images in full HD and 1080p-1920p videos were used for documentation. Four experienced surgeons viewed the images. Results: The results of 8 comparisons with minimal and mid-range (optical zoom) magnification from the gallbladder fossae and stomach region were the same: 30′ SRT vs. 0′ MV telescope: The 30′ SRT had slightly more light transmission than the MV, otherwise identical; vs. 45′ MV minimal difference in perspective of angle view, no difference in illumination, detail, depth of field; vs. 70′ MV significant perspective of angle view, no difference in illumination, detail, depth of field; vs. 90′ significant perspective of angle view, no difference in illumination, detail, depth of field; vs. 120′: significant perspective of angle view, no difference in illumination, detail, depth of field. Subjective determinations showed a significant difference in view between 0′ and 30′, 30′ and 70′, 45′ and 70′, 70′ and 120′ degrees, but not between 30 to 45 degrees. No instrument to laparoscope collisions were encountered. 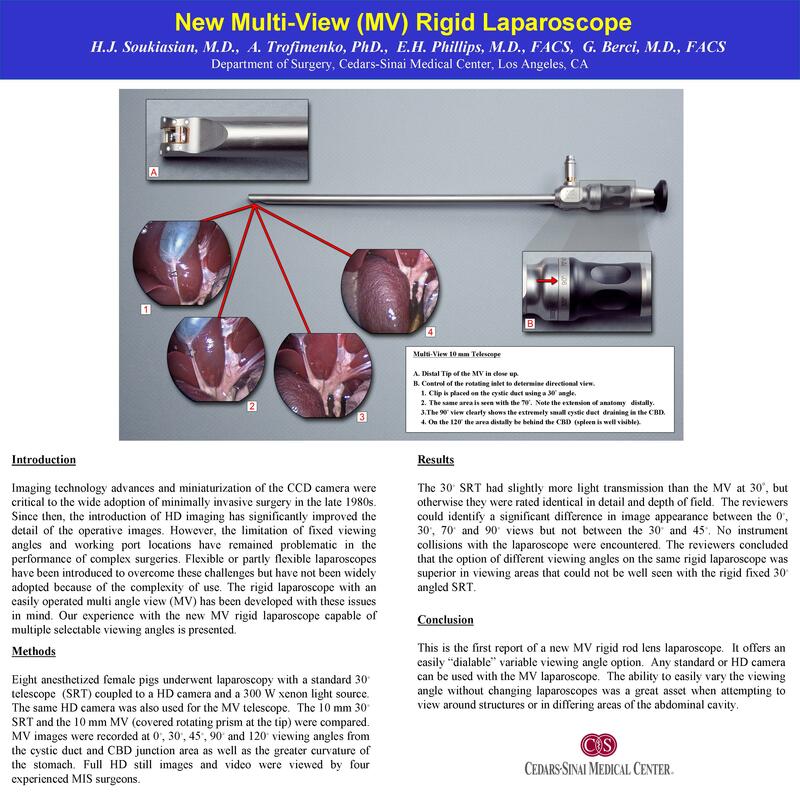 Conclusion: This is the first report of a new multi-view rigid rod-lens laparoscope system. MV offers easily “dialable” perspective options during laparoscopic surgery compared with SRT. Any standard or HD camera and light source can be used with the MV laparoscope. The novel illumination provided by the MV scope was adequate from 0′ to 120′ degrees of viewing angle. The ability to easily vary the viewing angle without changing laparoscopes is a great asset, especially in viewing areas that are difficult to access.